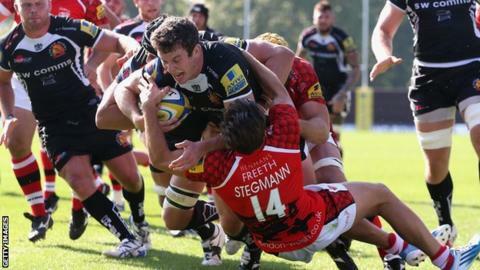 London Welsh's return to the Premiership started in miserable fashion as Exeter Chiefs handed out a seven-try thrashing to the Exiles. Thomas Waldrom scored twice on his debut and David Ewers and Sam Hill added tries after the break. Welsh fell apart as the game drew on and Ian Whitten bundled over from a line-out before Jack Arnott crossed seconds after coming off the bench. Chrysander Botha's score then confirmed Welsh's biggest ever Premiership loss. Welsh will have aspirations of emulating Chiefs' transformation from a Championship side to Premiership mainstays and brought in 25 players during the summer in a bid to avoid a repeat of their relegation two years ago. Their demise in 2013 was influenced in some part by a five-point deduction for fielding an ineligible player, but if the Exiles had any doubts over the difficulty of staying up this time around, they will be well aware of the challenge after this mauling. While they saw plenty of ball in the opening stages, with New Zealand World Cup winner Piri Weepu controlling the tempo from scrum-half, Welsh lacked fluidity and guile, which is perhaps a symptom of fielding a XV containing nine debutants. It was just four years ago that Exeter made their first foray into the top flight and it speaks volumes of the progress made at Sandy Park that an eighth-place finish last season was considered a disappointment, despite winning their first major trophy by claiming the LV= Cup. Former England international Waldrom was one of seven summer additions to Rob Baxter's side, and his impact was immediate in a slick and ruthless performance from the West Country outfit. After Chiefs had absorbed a period of Welsh pressure, the number eight finished a move that started deep in Exeter territory by collecting an offload from Gareth Steenson and then had his second shortly after when Hill made progress and slipped in the former Leicester Tigers back row down the left flank. Henry Slade added a penalty from the halfway line, while Olly Barkley put two presentable chances from the tee wide of the posts in a rare chance for Welsh to score points. Proceedings became even more straightforward for the visitors after the break as Ewers crossed after a burst by former Exile Mitch Lees and Hill secured the bonus point by stealing the ball from fellow number 12 Tim Molenaar in the tackle and rushing to the line. Whitten landed the fifth after a maul at the line-out before academy product Arnott, moments after coming off the bench for his debut, got his name on the scoresheet by collecting a Will Chudley box kick. Namibian Botha, in his first start for the club, sprinted under the posts and Steenson completed a flawless afternoon with the boot by sending over his seventh conversion. "The season is 10 months and we know what it's about. "We could have stayed in the Championship and played in front of 800 people, or we could play in the Premiership and put our hands up. "It's pretty straight forward - we can go home and hide away, or we puff our chests out and put a smile back on our faces. "We play Bath next so it doesn't get any easier, but we just have to look forward to that. "It's 52-0 and we have nothing on the scoresheet. Maybe people will look at that and take us for granted, which may not be a bad thing for us. "It's not a case of regrouping or those cliches, it's about learning from your mistakes and rectifying them. "When people are making individual errors, that has absolutely nothing to do with the number of signings you've made. "If you're a professional player, you have to make your tackles, make that final pass and hold on to the ball." "Thomas gave us what we're after - he's a rugby player and he combined well with Dave Ewers in the back row. "Tom has come in, he's been grounded and has worked hard in pre-season. "We like rugby players here, we're not just one-directional. We have to consider all options in attack." Exeter Chiefs: Botha; Whitten, Slade, Hill, Jess; Steenson, Thomas; Rimmer, Yeandle (capt), Francis; Lees, Caldwell; Ewers, White, Waldrom.